Active ECO helps improve fuel efficiency by controlling the engine and transaxle. But fuel-efficiency can be changed by the driver's driving habits and road conditions. 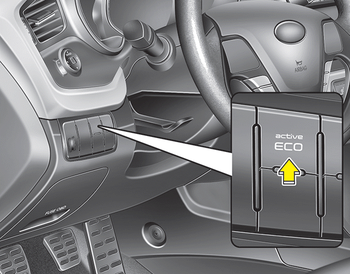 When the Active ECO is activated, it does not turn off even though the engine is restarted again. To turn off the system, press the active ECO button again. If Active ECO is turned off, it will return to the normal mode.